It’s contest time! This time it’s on Facebook, so please take a look at my Facebook page to enter. The winner gets to tell me how to color a brand new medieval dress! If you don’t use Facebook, no worries, because I plan to move the contests around. The next one may be over Twitter, through my mailing list or on this blog. This was colored for the winner of my last contest, Lauren. She guessed that my son had a thing for spoons. (It’s been long enough since then that he can’t be easily amused by just handing him a grown-up spoon. No, he wields spoons on his own these days, and he only needs me to just scrape up the last bits of peanut butter oatmeal for him.) 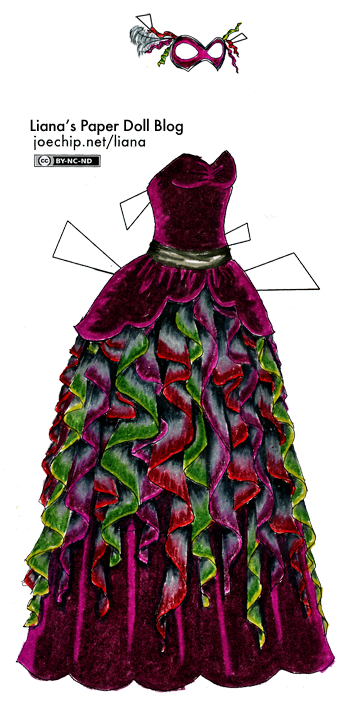 Lauren wrote, “I like the ruffle gown from the may 15th 2010 post; I picture it in a dark purpely magenta with wine red, olive green and charcoal grey accents. I think the dress should have a velvety, smoky look to it.” I hope you like it, Lauren! 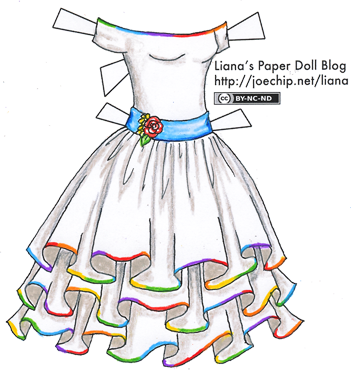 I decided to use colored pencils for this dress, just for old times’ sake. If all goes well, this will be the last dress for Grace and Ivy, and it just seemed right to color it this way. I haven’t touched my colored pencils for so long that when I started taking them out, I felt like the hero of a samurai movie or a Western who’s forsworn violence taking up the sword or gun one more time. Because of my carpal tunnel, I’ve been scared of what it would feel like, but my thumb didn’t go numb at all. It just felt awkward to draw with a brace on my hand, and my hand ached slightly. This experience made me feel more confident about moving to digital coloring. I’m not saying I’m never going to use colored pencils again, certainly. 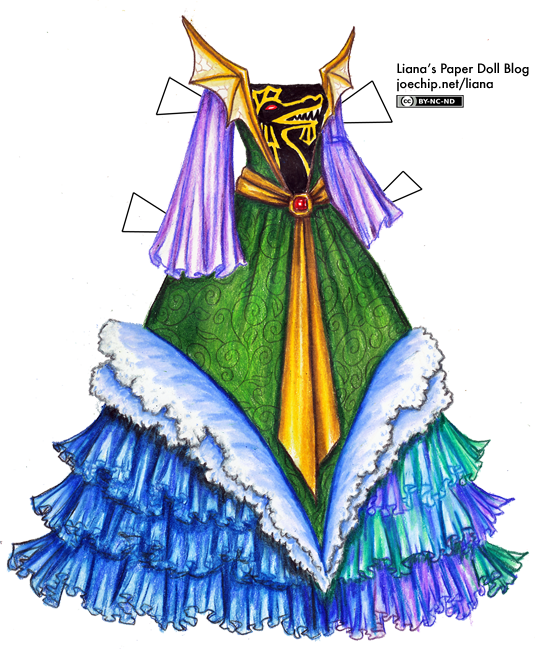 It was just plain fun to draw with them, and I’m glad I did this dress in them. But they have so many drawbacks compared to digital coloring! For one thing, they never look as good as scanned as they do drawn. This one looks much more subtle in reality, but if I try to even it out once it’s scanned, it just looks washed out. Doing digital coloring, I know from the start how the color will look in the end, and it’s much less frustrating. Plus, I don’t have to deal with a hundred plus pencils, not to mention sharpening them. That’s a real concern! If I’m drawing while my son naps, there’s no sharpening for me. One of the biggest problems is that there’s no changing things after the fact. 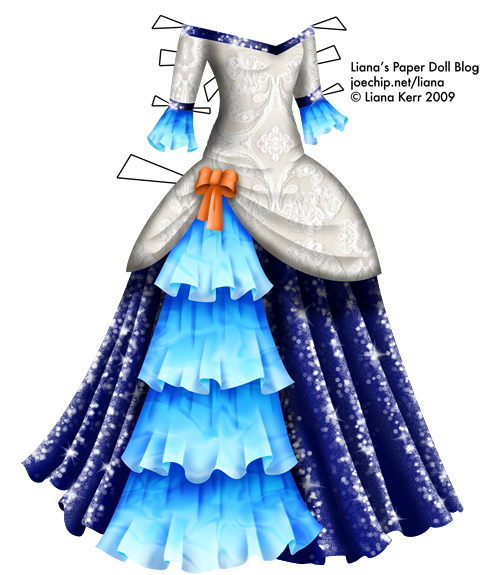 I decided, after drawing the first green ruffle, that the ruffles really needed just a touch of a lighter color on the edge, otherwise they looked too flat. But it was too late to add it with colored pencils. (I added just a touch of green in Photoshop later.) With colored pencils, I put something on the page and that’s where it stays, but I can redo lines, colors and so on as often as I need to when I’m using Photoshop or Procreate (my iPad drawing program). This can be both good and bad — you should see me redraw a simple-looking line ten times to get it just right — but mostly I think it leads to better drawings. It does make my hand hurt, sadly, although it’s nowhere near where it was when I first started wearing the wrist brace. I can tell that I don’t want to do the detail work that really makes a drawing great, just because it would involve a lot of gripping the pencil tightly and pressing really hard. It makes me feel like I just want to get this drawing done already. Next Friday, if all goes well, you’ll meet my new doll and see the site redesign! If all doesn’t go well, I’ll still have something pretty for you to enjoy, so no worries. Wish me luck, and wish my husband Brian luck, because he’s the one doing all the fiddly WordPress stuff! Don’t forget to enter my contest on Facebook, and for updates on how the new content is going, follow me on Twitter. Also, if you use Pinterest, please check out my profile: I’m taking a page from RLC’s book and using it for paperdoll reference — and plain old pretty thing reference, too. Edit Jan. 24 1:17 PM: My mom suggested that I add a mask, and I thought that was a great idea, so I did! The PDF has now been fixed, too.